PARIS (Reuters) - France and China signed deals worth billions of euros on Monday, including a huge Airbus plane order, during a visit by Chinese President Xi Jinping, despite Paris pushing back against Beijing's "Belt and Road" infrastructure initiative. President Emmanuel Macron wants to forge a united European front to confront Chinese advances in trade and technology. Xi's visit also provided a stage for protesters seeking more European action over the alleged mistreatment of minorities in China. "Europe must be united and have a coherent message. That's what we are doing on strategic investments," Macron said in a joint address with Xi. Neither leader took questions. After Macron and Xi meet on Monday, the two will hold further talks on Tuesday with German Chancellor Angela Merkel and Jean-Claude Juncker, head of the European Union executive. Xi arrived in France after visiting Italy, the first Western power to endorse China's ambitious Belt and Road Initiative as Rome tries to revive its struggling economy. The Belt and Road Initiative (BRI) plan, championed by Xi, aims to link China by sea and land with Southeast and Central Asia, the Middle East, Europe and Africa, through an infrastructure network on the lines of the old Silk Road. Macron said European firms needed better access to China, more trust in their exchanges and a tangible improvement in the business environment and fair competition. He said the BRI had to meet international norms. The two sides signed 15 business deals totalling about 40 billion euros ($45 billion), including an order for 300 Airbus planes estimated at 30 billion euros alone. The contracts ranged from the renewable energy sector to shipping and banking. Macron also said China has agreed to lift an embargo on French poultry. In a column in the French daily Le Figaro published on Sunday, Xi made clear he wanted Paris to cooperate in the Belt and Road project, calling for more trade and investment in sectors ranging from nuclear energy to aeronautics and farming. "It's up to us to work with France to develop a global and strategic partnership that is more robust, stable and dynamic," Xi said alongside Macron. "We want our development to benefit others and that's the case with the BRI." 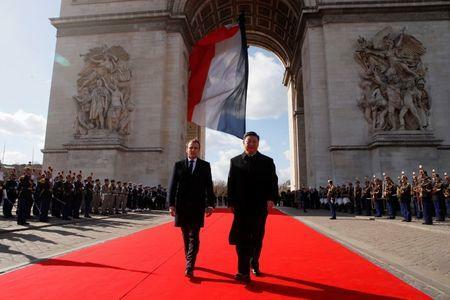 French officials describe China as both a challenge and partner, saying France must remain especially vigilant over any Chinese attempts to appropriate foreign technology for its own purposes. The EU is already weighing a more defensive strategy on China, spurred by Beijing's slowness in opening up its economy, Chinese takeovers in critical sectors, and a feeling in European capitals that Beijing has not stood up for free trade. As part of efforts to further that approach, Macron will play host to Merkel and Juncker on Tuesday to meet with Xi to move away from a purely bilateral approach to ties. "Macron is not happy to see China win so many prizes in Rome, so he has invented a bizarre European format by inviting Merkel and Juncker as a counterbalance to show that he is the driving force behind European integration," said one Paris-based Asian diplomat. Rights organisations also urged Macron not to skirt the subject of human rights in China, especially Muslims in China's Xinjiang region. Several hundred demonstrators converged in central Paris on Monday with slogans protesting against the alleged mistreatment of China's Muslim Uighurs and in defence of Tibet, 60 years after that region's failed uprising against Chinese rule. "The European Union is based on respect for individual freedoms and fundamental rights," Macron said. "That's why France brings this issue up in its dialogue with China to express concerns that are ours and those of Europe on the question of respecting fundamental rights in China."